We have moved into our temporary digs in Eureka. It's a two-bedroom place that is a cross between a sterile hotel room and a comfy home, although erring on the side of sterility. White walls, fake art (is there such a thing as fake art, yes, I think it can be so argued). Still, we are comfortable. We've brought in a few of our dishes, our pots and pans, our wooden-handled serving spoons from Thailand. Little things make a big difference, like the photo of an eagle tucked in the corner of our bedroom mirror, a piece of cloth brought back from Spain by dear friends placed on the dresser. We did not buy the environmentally green house, but we did make a wonderful, warm connection with Becky and Brian. Enjoyed a fine barbecue with them the other night, met other enlightened locals, and immersed ourselves in the ambiance of our new home town. We've been in Humboldt County for nine days. We've had dinner with Roger's daughter Indigo four times. It's truly the best of times. It's why we came. Aside from the fact that we are basically homeless, life is pretty good. We are walking familiar paths and sniffing the familiar California air. There are things that remind us of home that have nothing to do with structure, walls, and windows, but with place, heart, and contentment. Home and homeless, we are. Sunday morning we woke to perfect blue skies and still air. The whipping winds of the past few days had finally stopped. 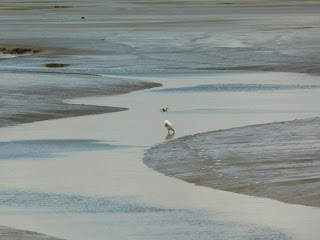 We headed north just about ten miles to Trinidad and took a nice walk along the beach. There are always more people out and about here than there were in Port Townsend. Of course this is a long, three-day weekend. Families are supposed to be flocking to the beautiful shoreline where children frolic in the tidepools, shouting about sea stars and the freezing cold water they are standing barefoot in. All is as it should be, right down to the single child-sized sneaker left behind, still with a little blue sock in it. On Saturday we took a chance and answered an ad on Craigslist about a house for sale. We are no where near ready to buy a house, but we couldn't resist looking at this incredible place. 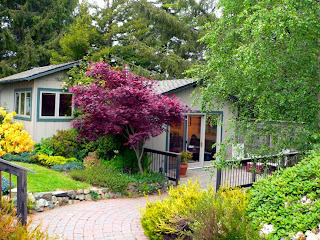 An old house that's been converted to a modern, environmentally green home, fully solar-powered, 5000 gallon rainwater collection system, composting toilet, organic gardens, bog and fish pond, fruit trees. We had to look, didn't we? It's what we want to build for ourselves. When I knocked on the door, I never expected to recognize the woman who answered. But there she was, an acquaintance of at least a dozen or more years from Santa Cruz. What an incredible and happy coincidence. She showed us around and introduced us to her partner. Someone we had heard of, but never met. A truly remarkable man. On this Memorial Day weekend, we consider ourselves lucky to be in the presence of such pacifists, patriots and peace warriors. We remember all those who have given everything. Please click on the above photo. It is a panorama, six shots taken Sunday morning at Trinidad Beach. My younger sister Lynn flew to Seattle last Sunday so she could drive down to Humboldt County with me and the cat. I drove the first 90 miles along the beautiful Hood Canal. She drove the remaining 520 miles. We didn't plan it that way, it's just the way it worked out. She likes to drive. I like to sit and look out the window. We've been wanting to do a road trip together for years. In fact, I don't think we've driven this far together since we moved from New Jersey to California nearly 40 years ago. We had a great journey. We found that the miles flew by when we talked, and they flew even faster when we laughed. So, laugh we did, about everything. We could make a joke out of whatever was in front, behind or to the side of us: roadside crews, other drivers, bike riders, and road signs. The sight of a Dairy Queen sign, of which there are many, was enough to send us over the edge. She said, "Everybody loves ice cream, but come on, why is there a DQ sign at every exit in Oregon." I asked her at one point, "Don't you think it's weird that you came all the way to Port Townsend just to drive me south?" She said, "Nope. I love this!" Lynn is an incredibly easy going person. She definitely has the patience and equanimity genes of the family. Nothing ruffles her. Not even my anxiety around hair-pin turns, when I screeched every time she crossed the center line. She would just smile at me and say, "I'm ignoring you. I'm good at that." She was. 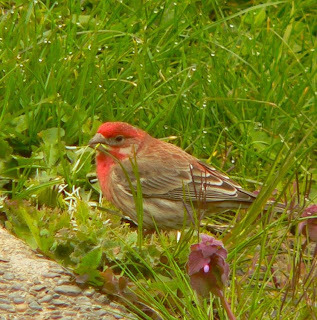 We took her to the Arcata Airport Thursday morning. It's the smallest airport I've ever seen. She had to get on a Turbo-prop plane that seats 30 passengers for her flight to San Francisco, a one-hour layover, and another small plane flight back to Burbank. She did all of that for me and Roger, for fun, for a road trip, and out of the goodness of her very big heart. She's truly the best sister. Thank you, Lynnie-girl. PS-- I wish I had a photo of her. She's freakin' beautiful too. 1. 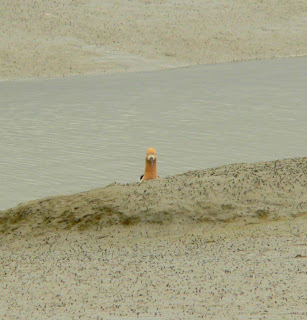 Top photo- Arcata Marsh. 2. Bottom photo- Guest house where are staying. If you look carefully, you can see Lynn on the couch. we are here!! where are you? two semi-long days of driving through some of the most beautiful parts of our country. along the strangely named hood canal (not a canal. an arm of puget sound, but still, lovely) and on down thru western washington and the willamette valley of oregon and the mountains of southern oregon and then off toward the coast down the smith river to crescent city. lastly, the north coast of california by stone lagoon and big lagoon and clam beach. we went to the co-op in arcata to shop for dinner. it is much bigger and grander than it was 35 years ago when i first joined and shopped there. quel surprise!! rice and stir fried veggies for dinner. and our daughter indigo! we are home, tho we don't have a house yet. we found our first refuge here on craig's list. our host and hostess are lovely people, reflected in our delightful little cottage and the beautiful yard. every window has a nice outlook. if i could find the cord that connects the camera to the computer you would have pix. we are very tired. we will sleep well tonight, cat willing. comments are appearing and disappearing randomly. not individual comments. all of them. and blogger just ate my previous attempt at this update. we're looking for the camera/computer cord. there's a pile-o-stuff just shoved willy-nilly into boxes as we backed out of the house cleaning as we went. middle daughter, who lives locally, came by to say hello and had dinner with us! escrow closed! the money is in the bank! and we probably have a nice furnished temp for june while we look for a suitable rental. this is working out well so far. comments still mysteriously on and off. 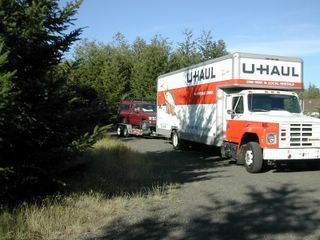 we left our former home in port townsend yesterday morning. robin and her sister and our cat in the car and me in my truck. both vehicles packed to the limit with last minute stuff that escaped scrutiny as we loaded the big truck (see picture in the post below). we arrived in roseburg about 5 pm and fairly soon got a call from a friend back in washington informing us that the big truck is gone, as we left before the pickup. then we had a marvelous dinner of sauteed tofu and rice prepared sunday by robin, and baby greens from the greenhouse, picked minutes before we departed. a last treat from the garden. and wine. storebought. the cat did complain a lot last night. so we and our goods are all enroute to california. it was hot and humid all the way yesterday (aaahh for air conditioned vehicles) and it is raining this morning. 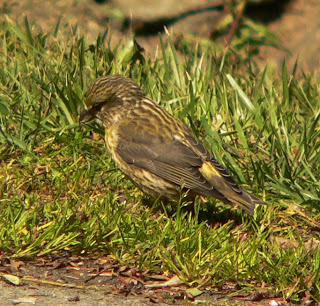 next post from mckinleyville, ca. we arrived in this in 2004.
and our stuff leaves in this. i don't think we'll fill it. and i don't have to drive it! but we do have to get the stuff into it. our blog buddy phil recommended a post by doghouse riley, in which he hilariously takes to task the oster corporation for a shoddy toaster, which reminded me that i had occasion recently to do a bit of appliance repair. ok. not really repair. correction of stupidity is a closer description. 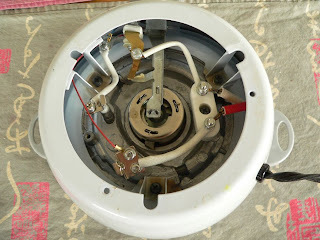 several nights ago, in taking the cooked rice out of our wonderful rice cooker, my attention wandered and instead of turning the rice into the waiting serving bowl, out of the removable metal pot that sits inside the cooker, i dumped it into the rice cooker itself. oops. sticky rice in the works. robin tried to pick out all the grains, but some rice had gotten way into the bowels of the machine. if the only bad outcome would have been the smell of burnt rice next time we used the cooker, maybe ok. but i was concerned that the mechanism that signaled the end of cooking had been compromised. i have been fixing appliances large and small since i was a teenager, and i have seen the downward slide of quality in toasters (smite oster, riley), irons, washing machines, dryers, stoves, bathroom fans, hair dryers, radios, tvs, and even computers (well, not computers in my teen years). imagine my surprise then when i exposed the innards of our rice cooker and found a substantial machine. there are washers AND lock washers on every electric and mechanical connection. i got the thing apart, cleaned it, and reassembled it easily. we gave it the smoke test and it passed. no smoke. perfectly cooked rice! it was a nice distraction from the craziness of packing and the worrying about close of escrow. in other news from chez bums we are about 95% packed and ready for the big truck friday. 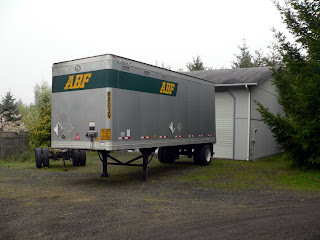 afb u-pack will drop off a 28' semi trailer. we will load it over the weekend and they will return monday and haul it away to eureka, ca and store it till we find suitable digs, hopefully within a month. Yesterday was Mother's Day. We didn't get to spend it with our mothers. We're hoping to do that next year when we are back in California, a part of the reasoning behind all the current chaos of our lives. The thing about moving is this: You literally have to touch every thing you own. Every thing. Imagine that. It's daunting, and reminds us why even before we buy things that we will eventually toss, that we simply should not buy at all. How many THINGS do we need? How many boxes labeled objet d'art, or boxes labeled even more obtusely stuff? Even after getting rid of five large boxes of books, we still packed five large boxes of books. How many things do we keep for sentimental value. Truthfully, all of them. We look at something and silently ask ourselves, will our hearts break if we give this up? The answer sends the object into one box or the other. We have gotten a bit more ruthless. Hearts toughen as we plod onward. Our packing gets reckless too. We started out organized and rational. We're ending up with boxes that are packed with electronic stereo components, flat cookie sheets and clothes that we won't mind not seeing for a month or more. How should we label that? The sun shines intermittently so we take a break and go for a walk. 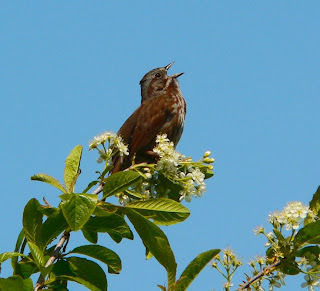 Song sparrows cheer us on. I have been inspired by Pohanginapete to play a bit with photoshop. He was inspired by Clare. These two are as far-flung a global inspiration as you can get. Tuesday May 13th is my 56th birthday. Despite all my haranguing about stuff, I plan to buy myself a good pair of play shoes. I have my eye on these. So begins our final week in Washington. 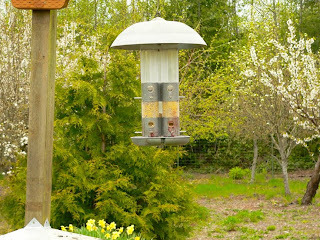 We would have been home to see whatever took place on the bird feeder to leave it looking like this. We think a very large hawk slammed a band-tailed pigeon about as hard as it could be slammed. 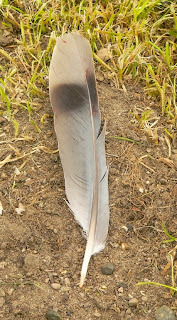 It left a single feather. We missed the whole thing. To say we are glad that we didn't see this attack would be an understatement. I corresponded most of Tuesday evening with Dawn of the Vulture Cafe. She looked at the photos and tried to help me solve the mystery. Was this really a band-tailed pigeon kill? 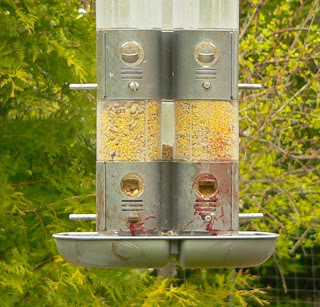 Did the bird get hit on the feeder, or on the ground and then carried up to the feeder? What size hawk could carry a large pigeon off? 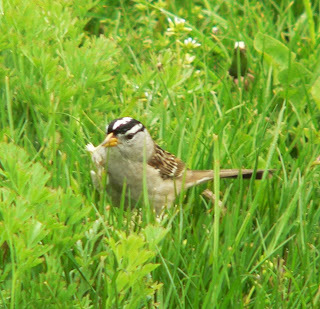 Dawn sent us a link to a fantastic site for identifying feathers. She also wrote: Ok no more leaving when a raptor is busy killing your feeder birds. She's right, of course. It's hard to take our eyes off this yard. There's always something going on, but still this time we were glad we didn't see this particular moment. Timing is everything. 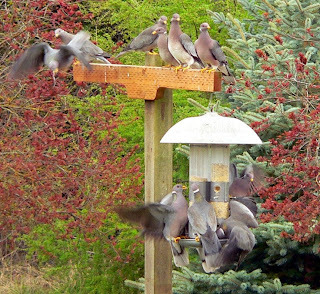 I updated the post to show what the Band-tailed pigeon flock looks like on the feeder. Photo taken Wednesday morning. That's about half the flock, the other half was on the ground. We had friends over to dinner Saturday night. We made spinach salad and homemade pesto pizza. They brought a homemade three-cheese tomato pizza. We stuffed ourselves on good food and conversation. They have their house on the market too, so we had plenty to talk about. It's interesting how we know these friends. We met them a couple of years ago at a birthday party. J was talking about being from Detroit and southern California, that he had gone from LA to Eugene, Oregon, that he was a nurse. That particular journey sounded familiar to me. I looked at him over the table and asked him what his last name was. He told me. I couldn't believe it. I not only knew him, I knew his whole family. I had sublet his house in southern California 30 years ago. My sister and brother-in-law were maid of honor and best man at his brother's wedding in the 1970s. One of his brothers put in a fence for my parents. There we were at a birthday party of a mutual friend in Port Townsend, Washington in 2005. He and his wife V, and Roger and I became fast friends. We've done cat care for each other. We've spent many a good evening in each other's company. Here we were, Saturday night sharing a meal and contemplating futures in very different places. After dinner, we had planned to watch a movie together. We had Leonardo diCaprio's The Eleventh Hour, and they had brought The Golden Compass. I was drawn to the documentary, but Roger said he was ready for pure fantasy. I didn't really know anything about The Golden Compass but decided that I would give it try. Such wild, wacky storytelling with fantastic animation appealing utterly to my long-sleeping inner child. I love a movie that makes me want to ride a polar bear through the northern icy tundra. Or makes me wonder if I had an animal daemon, what it would be. What fun. There was a scene where the good polar bear had to vanquish his enemy, the bad king polar bear. Because I am a softy wimp, I couldn't bear to watch the fight. I got up to check on the dishwasher (a perfectly good excuse). 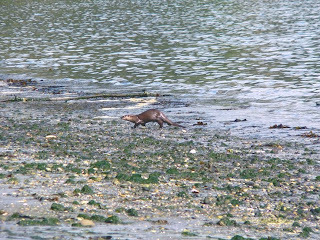 As I walked across the kitchen, I had a pang of nostalgia for that very moment: for good friends on the couch, for this big spacious beautiful house that we will be leaving, for the garden already planted, for minus tides and river otters, for our backyard birds. I suddenly knew what I will miss when we are gone from here. I don't know yet what piece of music months and years from now will tug this Port Townsend heartstring, but whenever I get the urge to ride on the back of a polar bear I'll be here in that moment, in that kitchen, with those friends.